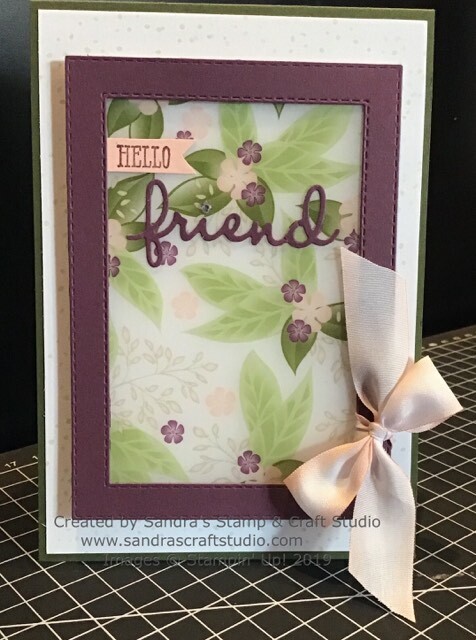 Hello and welcome back to another hop around the globe with our Stamp ‘N Hop group of Independent Stampin’ Up! Demonstrators! A big warm English welcome from me, Sandra, here in Norfolk, UK. Todays ‘Blog Hop’ theme is ‘Girls’, so we set about creating any female themed projects, using our favourite products. My choice immediately went to the Wonderful Romance Suite, together with the beautiful Designer Series Paper which contains two floral velum patterns featured here. 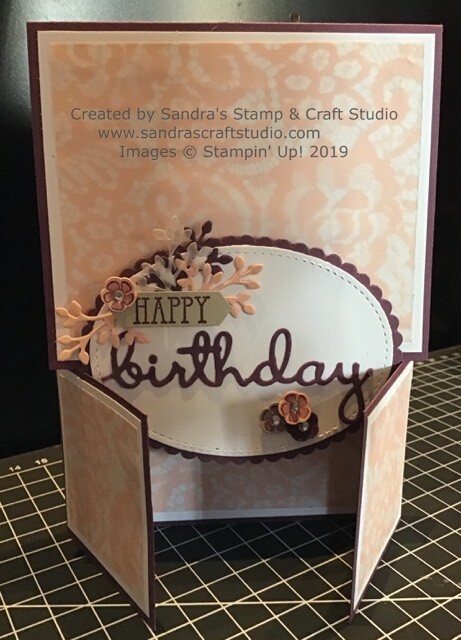 My first card today is a Dutch Barn Door style card. 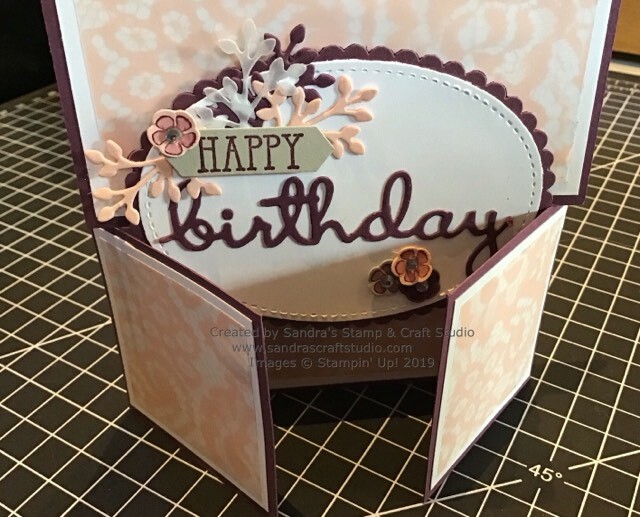 This is made using a standard A6 tent style card. Next I sliced a 6cm section off the bottom of the front panel. Cut a long strip of card 6cm wide and long enough to wrap around the entire card. Position in the centre back and wrap to meet at front centre. Be careful with measurements in order to meet the ‘doors’ at the front. Cut panels of coordinating card and patterned vellum as you wish, decreasing layer size by 1/2cm with each layer. For the decoration in the centre, I used a scallop oval from the Layering Ovals Framlits and another oval from the Stitched Shapes Framelits. 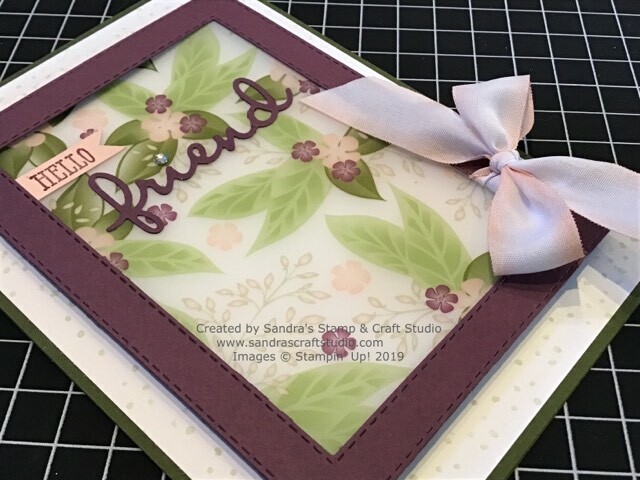 Further detailed decoration was added, die-cutting sentiment of your choice and some filigree stems and flowers from the Wonderful Romance bundle in coordinating colours, plus a few cut from vellum cardstock. I started by cutting a double frame using two Rectangle Stitched Framelits leaving one size difference. The patterned vellum was then cut with the Framelit size in between. Before assembling card, wrap a piece of variegated ribbon round the frame, adding some lovely soft detail. This beautiful patterned vellum just shouts ‘female’ to me, especially with the soft variegated ribbon. I hope you have enjoyed my cards today, using the Wonderful Romance Suite in the Spring/Summer 2019 Catalogue. 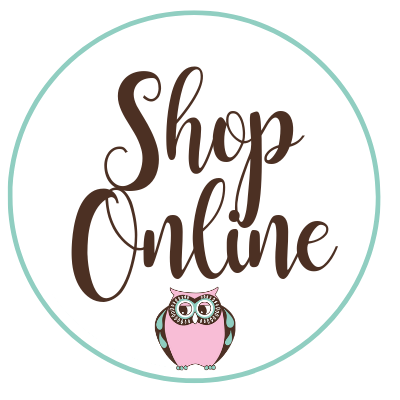 We love to read what you liked about our projects, so would love you to leave me a quick comment before hopping to Jenn’s Blog to see what she has been crafting for you today. 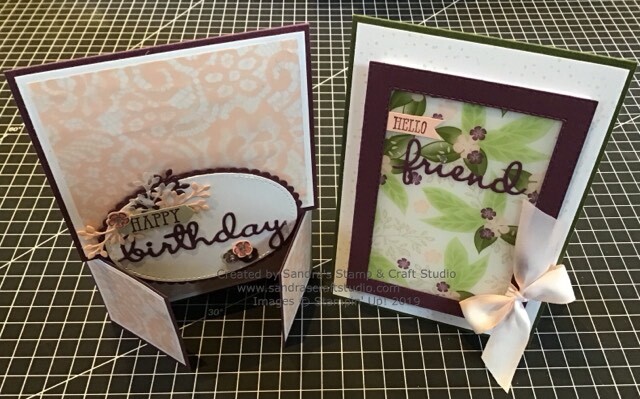 Love this DSP – perfect for girly cards. I’ve never tried a barn door card before, thanks for the inspiration.